What a mad year! Richard and Ellie just on the final week of the stratospheric Us & Them Tour for Roger Waters, currently in Canada. 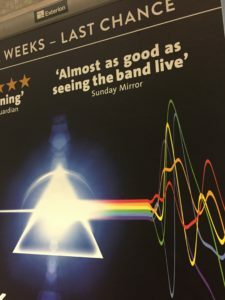 Beki spent the early part of the Summer pulling together the performance zone for ‘Their Mortal Remains’ the Pink Floyd Exhibition at the V&A with a great team including Richard Kenyon, Martin Seymour, Jack Beccegato and the lovely people from ER Lasers. Feedback has been fantastic, my favourite quote pictured above. What beckons in 2018 for the Lucky Frog Team? Watch this space.